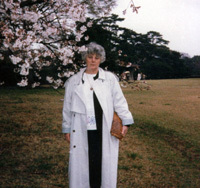 The charism of Divine Innocence, Surbiton, Surrey, England has come through inspired messages given to the instrument, Patricia de Menezes beginning in 1979 and this inspiration continues to be given. This instruction given by Our Lord, Our Blessed Lady and St. Joseph is to help us live the life of the Holy Family and to walk in the Way of God’s Divine Innocence. It consists of a spiritual and practical training rooted in the sacramental and devotional life of the Church, to help us regain our lost innocence and to help restore peace to the family of mankind. In the charism of Divine Innocence Our Lord shows that He has founded a divine order of things in creation, in the Holy Family and in the Church to help all mankind live according to the Order of Divine Innocence. When we move away from this Divine Order founded by Christ, we suffer or cause sufferings to others. 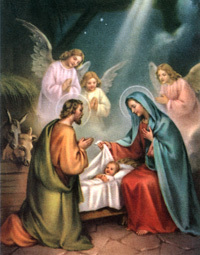 The Divine Order of the new Christian Family was established in the Holy Family of Nazareth and in the Church to help men, women and children wounded through sin to regain their lost innocence - so that Christ’s ‘Divine Innocence is triumphant in our crucified innocence.’ The Holy Family helps us to live God’s divine order of things in our everyday lives and to make our lives Christ-centred. The Trinitarian life of the Holy Family of Nazareth is the Motherhouse of the Church. We are being shown that we can all live in Nazareth Universal and serve the Novitiate of the Holy Family as a living reality. Personal history of the instrument, Patricia de Menezes. Patricia de Menezes was born Patricia Warburton Adamson in Bristol England during the War years on the 4th of March 1940, the youngest in a family of four boys and two girls. After the family house was destroyed during a bombing raid the children had to be evacuated to safer areas in the country. Many places refused accommodation to those with children so Patricia’s mother was obliged to separate the children because six children were difficult to place together. 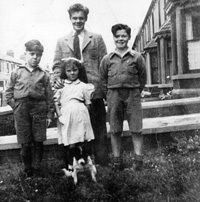 Patricia as a baby was sent to different families and eventually to the orphanage and nursery of the writer and broadcaster J.B. Priestly. Towards the end of the war the family were again re-united in the northern seaside town of Blackpool where Patricia grew up and went to school. Her religious background was Protestant. She was sent as a young child to the Salvation Army services. Later at different schools she was required to attend the Methodist, Baptist and later the Anglican Communions. Prejudice against Catholics was very much part of her background. She attended the Protestant Sunday School, heard the Bible stories and learnt hymns of praise and thanksgiving. It was while singing the Hymn; “There is a green hill far away behind a city wall, where Our dear Lord was Crucified he died to save us all” that Patricia as a child saw a vision of the Crucified Saviour. She remembers feeling deep sorrow for Jesus on the Cross. 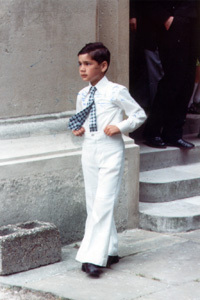 At the local Catholic School she saw a procession of First Communion children, the girls dressed in their white dresses, veils, white gloves and carrying white prayer books. Patricia remembered longing to be like them. Warned that if she ever entered a Catholic Church there would be dire consequences, only made her more interested in seeing inside a Catholic Church. One day after school she achieved this and remembered standing beneath a large statue of the Sacred Heart, wondering why the Heart of Jesus was shown outside his body. She told no one she had entered this forbidden territory. Family holiday with her parents and friends. Patricia is in the front with her mother and sister in the back row with her brothers. Her third brother is between two friends in the front row. When she was 16 years old she left England for Canada to join her eldest brother and his wife and children. She worked as an au-pair for two years and then joined an insurance company and did general office work. Being artistic and dyslexic she found this difficult and boring. Her real interest was art and she studied commercial illustration moving to New York in 1962 at the age of twenty one, first to work and later to study Art and Fashion Illustration. During her stay in New York she met a Catholic man from Goa and both returned to England. She agreed before marriage to allow the children to be brought up as Catholics. The couple were married at the Church of Our Lady of Victories, Kensington, England in 1965. 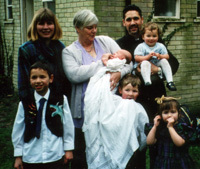 Their first child, a boy was baptised although his mother had not yet received the Sacrament. She continued her studies at the Maidenhead College of Art in Berkshire, where she received the Southern Region Diploma in Art and Design with first class honours specialising in both Fashion and Jewellery Design. She received the ‘Licentiate of the Society of Designer Craftsmen’. When offered a placement at the Royal Collage of Art, she had to decline because a second child was on the way. She had to make the decision between a career or motherhood. She felt the children needed their mother at home. In due time a third child was born, a girl. Patricia worked from home as a freelance designer. Having promised a priest to raise the children as Catholics, she felt obliged to take instruction in order to fulfil that promise. Having been warned as a child that Catholics were heretics who worshipped statues, she inquired if Catholics were Christians! The surprised priest assured her they were. She had no intention of becoming a Catholic herself, although during this time she felt an overwhelming desire to be baptised. Those giving her instruction mistook this desire to be an understanding of the Faith and a desire to become a Catholic, Patricia simply wanted to be baptised. She arrived at the Church of the English Martyrs, in Reading, Berkshire, for her Baptism and was asked what Saint’s name she had chosen. Patricia stated that she did not know any saints, so she was given Our Lady’s name, Mary. 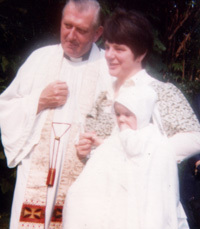 Without understanding the full significance of what was happening she was baptised into the Catholic Church and felt an overwhelming sense of love and forgiveness. Patricia had not understood the instruction in the Faith because she had never before come across the Catholic vocabulary and was too shy to ask what it all meant. She did not know that Christ was really present when she received Holy Communion. One day Patricia was riding her bicycle through the countryside and as she passed a field of ripe corn blowing in the wind, she heard a loud voice say: “I AM THE BREAD OF LIFE”. She knew that the voice was from God and she felt a great desire to find this Bread of Life and eat it and wondered for a long time where it could be found. Only later did she realise that Jesus is the Bread of Life and Catholic’s have the opportunity receive this wonderful Bread of Life every day. She came to understand that Christ’s Real Presence, Body, Blood, Soul and Divinity is in the Blessed Sacrament we receive in Holy Communion. Having accepted that Catholics were Christians, she thought they were just another Christian denomination. She received further brief instruction, which again she did not really understand and one year after her Baptism she was Confirmed. All instruction then stopped. However, she did not forget her promise to the Priest to bring her children up as Catholics, which she understood as bringing them to Church on Sunday but she did not know that Sunday is a holy day of obligation and a picnic in the country or other family outings could take precedence. During Mass she would copy what everyone else was doing. She avoided Confession, there being no way she could copy those attending private confessions and she had no idea what she was expected to do in the Confessional. She was not aware of the full significance of the Holy Sacrifice of the Mass and the other Sacraments. It was through reading the Catholic Truth Society books at the back of the Church that she came to know the lives of some of the Saints. Patricia had no devotion to the Mother of God and never said the Rosary. In 1984 Patricia met a Priest who helped her to make a General Confession. The same Priest suggested that she join a Rosary group and make an Act of Consecration to Our Lady; he told her that Our Lady would take care of her. This Priest invited her to a Rosary group in a private house but Patricia had never heard the Rosary said before and was very suspicious of giving any honour to anyone but to God. When the leader of the Rosary group asked for Patricia’s coat, Patricia replied “No thank you I might not be staying”! She was afraid and had decided to stay at the back of the room so that she could leave promptly if necessary. Her plan did not work and she was invited to the front and given a leaflet on which there was an act of Consecration to the Blessed Virgin Mary. Not understanding the act of Consecration at the time, which she now knows was simply placing oneself in the motherly care of the Mother of Jesus, she prayed that if this Consecration was pleasing to God she assented to it but if not, that He would protect her from it! A little later Patricia came across the devotion of the Divine Mercy and she placed herself between the two rays of Mercy and Love coming from the Heart of Jesus as recommended in the devotion. Soon after this Our Lord and Our Lady began appearing to Patricia. They began to teach her the Faith and to give her the Message of Divine Innocence in the form of regular messages. These messages took the form of visions and interior locutions. 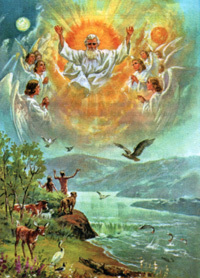 Many of the visions are a vivid visual Catechism. Some of the messages are of a universal character for the Church while others are of an individual nature for Patricia’s own spiritual life, but Jesus told Patricia that what he gave to her he gave to everyone personally. As Patricia’s knowledge of the faith deepened so did her understanding of the theological and doctrinal content of the messages. Our Lord followed a particular teaching programme and grace gave her a hunger for the Bread of Life. She was drawn to the Sacraments; Confession, Mass and Catholic devotions. A Jesuit Priest encouraged her to read one page of the Penny Catechism each day. Our Lord asked her to begin saying the Rosary and Divine Office, to study her Catechism more diligently. Later she studied theology in a formal way and with others in the community of Divine Innocence she received her B.A. Divinity Degree and has completed the Masters Degree course in Religious Education and Catechesis. Our Lord encourages all the faithful to undertake a life long study of the faith. The messages given to Patricia show that Our Lord is the Source and Sustenance of the Way of Divine Innocence, Our Lady is the Mother Foundress of the Divine Innocence Family, the Holy Family and St. Joseph is the Protector and Guardian of this Family. We are all invited to become committed members of the Holy Family, to be one Holy Family and People of God. The Way of Divine Innocence helps all men and women to understand and carry out their motherly and fatherly roles according to gender and vocation, according to God’s divine order of things. As mother foundress of the movement of Divine Innocence, Our Lord and Our Lady have asked Patricia to carry out her motherly role and responsibility in this community which now has members in 43 countries world-wide.